One of the hardest fish in the hobby is also one of the brightest! 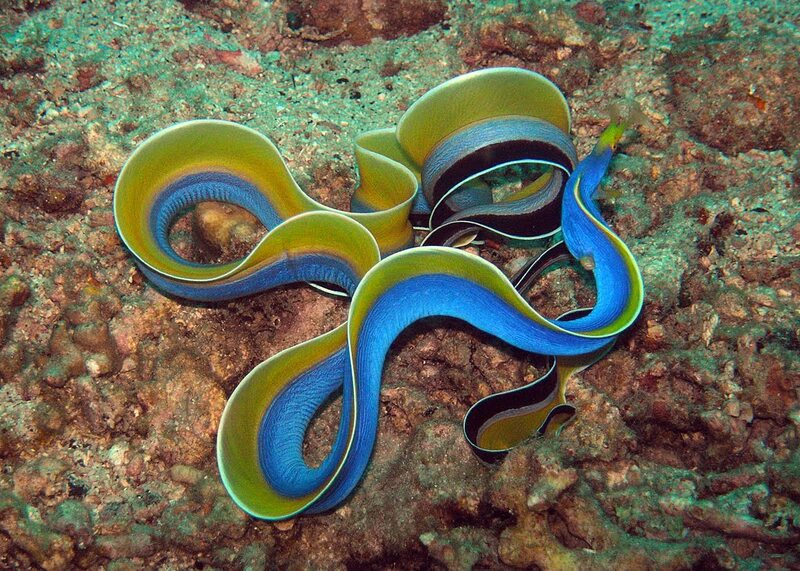 The Blue Ribbon Eel has one of the highest casualty rate next to the Moorish Idol. 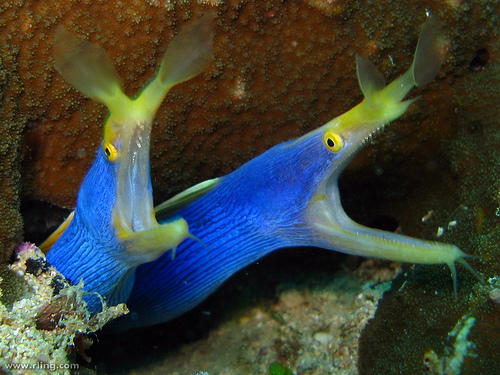 These eels are quite unique. They are bright blue and yellow and resemble a ribbon, hence the name. 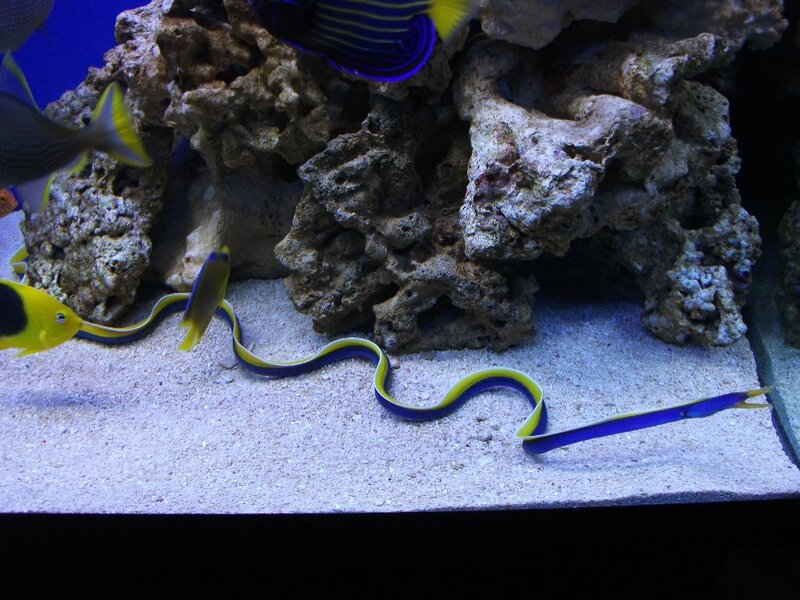 They are also called Yellow Ribbon Eel and Black Ribbon Eel. Unlike the more common Snowflake Eel, the Blue Ribbon Eel is much more slim and has a very distinguishing face. They only get around forty inches, which is not very large in Eel terms. These seem like the ideal candidate for a reef tank stocked with larger bodied fish, however these require much more care then other Morays. Problem One: Eels are generally chilling out in their caves. They sit there and wait for food to swim past and use the caves to hide from predators or in this case, humans. When someone tries to catch the eel like by hand or with a net they dart into the caves and are nearly impossible to safely remove. To make the catch more time efficient and safe for the diver they use cyanide to flush out the eels, which is not good for any creature. The eels initial experience is very harsh and makes them weak. The eels then have to deal with the stress of transport, acclimation to captivity, and then shipped to other places to ship or sell to other people or places. By the time the poisoned eel makes it to the home aquarium it has nearly reached the end of its rope! 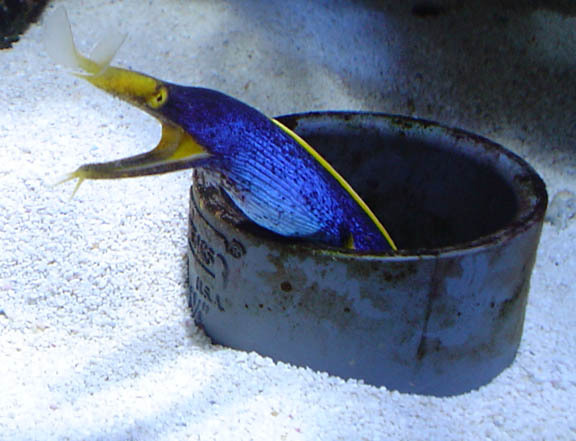 Problem Two: The Blue Ribbon Eel is a very finicky eater. They also require pristine water. The most successful way to get these guys to eat is to feed them live fish. The majority of hobbyists and pet stores that have got these fish to eat used rosy red minnows or guppies. Those are freshwater fish and can cause long term problems for any marine fish that eats them. A good alternative is to breed saltwater acclimated Mollies and use them as food. They are much healthier since their body chemistry actually adjusts to that of an actual ocean fish. Most people don’t have the means to set a breeding tank up or the space. The eels get weak if they can’t or don’t want to catch anything to eat and eventually starve to death. Problem Three: Escaping is the eel’s specialty. They are designed to squirm into tiny crevasses and fast! 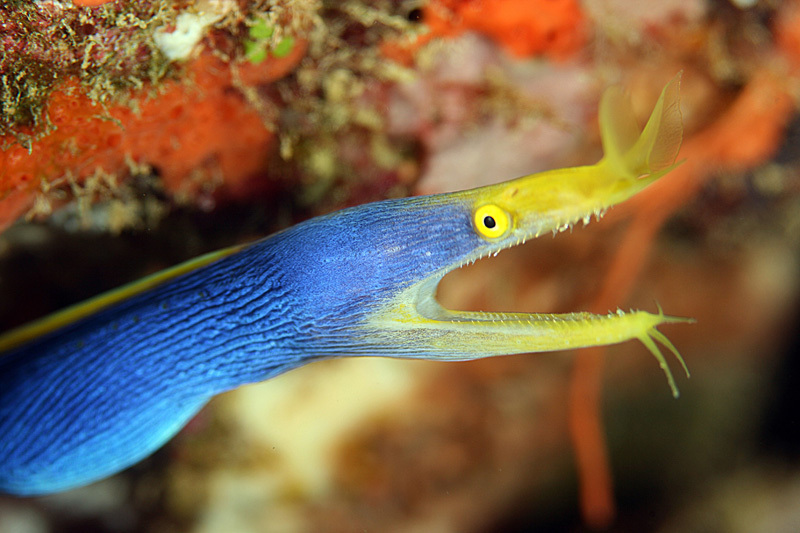 An eel can actually hold itself straight out of the water like a snake. The side of the aquarium is no match for the eel, however the eel is no match for the floor. If there are pets in the house the eel will not have any choice but to accept their bad decision to jump and become a nice snack for the cats. The tank must be secured or it won’t matter how finicky it is. With the cyanide poisoning, the whole acclimation/shipping process, and then finally the battle to feed it is no wonder these animals have such low success rates. The few who have had good results say these eels are really easy to keep and become a happy member of their tanks. The eel may be more hard to locate in good health than actually care for. If you can, find the source of the eel before you buy it and make sure it was captured in the least stressful way possible. These eels will only eat when they are comfortable with their surroundings and have a cave large enough for their long bodies. PVC pipes make great tunnels and you can get very creative with them. The eel is not guaranteed to accept PVC as a home but when they do it usually becomes a lifetime home for them. Buying one that is already through the quarantine process and eating gives you the best chance at having a good specimen. If you quarantine them you will need to make them a large PVC tunnel or have some large caves for them. Make sure to have a 2nd quarantine tank stocked with saltwater acclimated mollies which you will feed the eel. Once the Eel starts eating the live fish for a while you can start to feed it dead ones that are gut stuffed with anything you want to try to get it to eat. Krill, squid, mysis shrimp, or anything else that is not as demanding as a school of mollies. Once the eel accepts that meal you can subtract the dead fish from the equation and start feeding it its new diet of various meats enriched with vitamins. Your water quality should be perfect. No ammonia, nitrates, nitrites, and a pH of around 8.3 will ensure a healthy eel. Keep your temperatures between 72-78 degrees Fahrenheit and dKH between eight and twelve. They require a minimum of forty gallons since they are still rather long. They eat a lot so having supreme filtration is required along with regular water changed. Do not feed these eels by hand or they may bite you on accident since they cannot see very well. They have impeccable smelling, so once they do start eating they will come out every time the food hits the water. If you can overcome the initial feeding process, the life of the eel should be fairly long and happy. They do not mess with fish often but have been known to bite and swallow smaller ones when hungry or fighting for food. They make a great splash of color to the tank that stretches a few feet across the glass. If you are a Pacers fan with perfect water then this eel is definitely for you. Check out the Fish Forum for advice on your Blue Ribbon Eel or show yours to the world! We could use a few more positive experiences with this species.